Lately I've been investing in proper fiber tools (like my combs, which I now cannot do without) and it is well worth it. 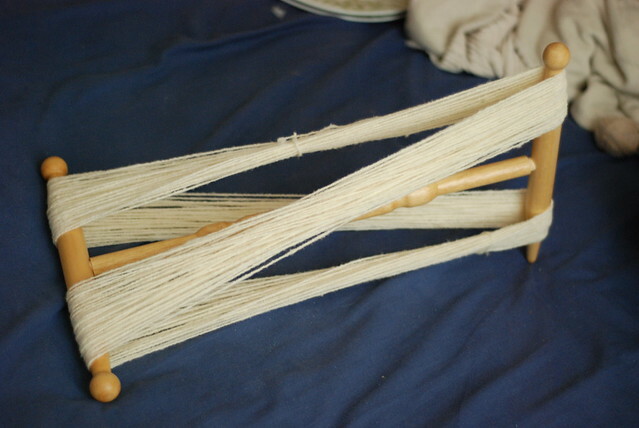 Up until now, I've been skeining handspun yarns on chair backs, books, or bits of cardboard (which does have the advantage that you can take notes on it). But I figured I was well past due to get a proper niddy noddy. I got it from Lazy Kate, who have a selection in a few different styles. I have to say I'm impressed. It's a functional, reasonably priced niddy noddy with several thoughtful details. The wood is smooth and nice to hold (no splinters here!). It's made of pine so it's light and easy to manipulate. The arms come off easily for storage. And, most ingeniously, three out of the four arms have a knob on the end - to keep your yarn from slipping off - and one is missing a knob. Not only does this make it super easy to slip the skein off at the end - it also makes it super easy to count the wraps! Every time you wrap over the arm without a knob, that's 2 yards. At first I wasn't sure how to wrap the yarn, but it's really very intuitive when you get going. You just go around and around, up and down. The very day it arrived I wound three hanks, no problem. My hanks look nicer, my yardage calculations will be more accurate (cardboard can bend as you wrap), and it's easier to wind them, too. This is definitely an improvement to my workflow. Yes! A niddy noddy is a critical tool. 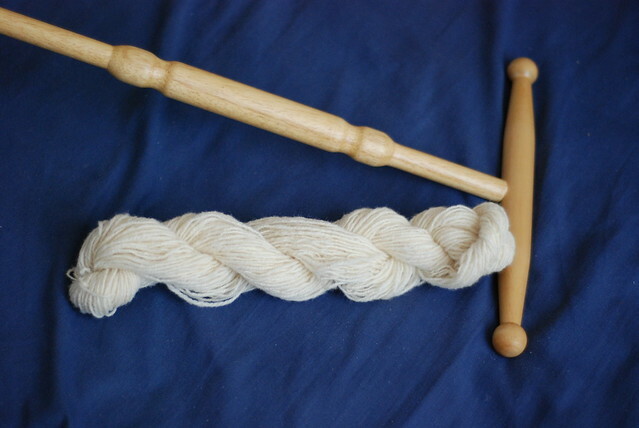 I mostly use mine for my handspun, but I find that I'm also using it to skein up remnants of commercial yarn that I don't want to leave caked up. Yeah, actually the thing that finally pushed me over the edge to buy it was I have some commercial yarns I want to skein up to dye. I can already tell I'm going to get a lot of use out of it, and it's both a functional and a beautiful tool.